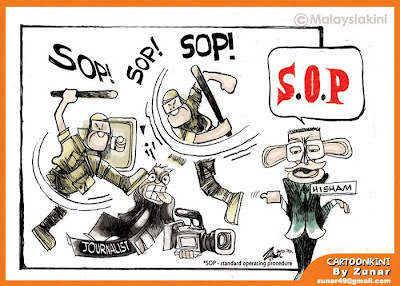 Zunar: Why ban cartoons during elections? A political cartoonist has attacked the ban on political caricatures during the next election as a case of shooting the messenger. PETALING JAYA: A decision to ban caricatures in the next general election was nothing short of hilarious, says a political cartoonist. Zulkiflee Anwar Haque (popularly known as Zunar) criticised Election Commission (EC) deputy chairman Wan Ahmad Wan Omar’s May 30 call, who claimed that political caricatures were inappropriate. “[The drawing of cartoons] is a legally-practised medium in Malaysia and therefore the EC does not have the right to forbid its use,” he said in a press statement. He said that instead of attacking the medium, the EC should have gone for the message itself. Political personal attacks, he added, could have come in any shape and form. According to a Bernama report, Wan Ahmad said that the 2011 Sarawak state election saw “too many” examples of “inappropriate” political caricatures. “The election is a serious matter and we cannot allow political parties to display campaign materials which put down any person,” he said at the time. The EC, he added, would remove any banners bearing political caricatures during the election campaign period, speculated to begin a few months from now. Wan Ahmad’s call left Zulkiflee, well-known for his unflattering depiction of the Malaysian government (especially of Prime Minister Najib Tun Razak and his wife Rosmah Mansor), wondering. He said that instead of banning cartoons, the EC should have spent its time fulfilling Bersih’s eight electoral reform demands (which include cleaning the voter rolls and free and fair media access). In defiance of the EC’s call, Zulkiflee said that he would be leading a group of cartoonists known as Kumpulan Kartunis Independen (KKI) during the coming election. “We will be opening our own cartoonist operations room and will be moving as a group in a van while campaigning for the coming election,” he said. Focusing on government scandals, the KKI’s cartoons would be distributed to the public. Court case on 23 May 2012 has been delayed. Keputusan kes Zunar saman polis/kerajaan Malaysia kerana tangkapan tak sah yang sepatutnya dijadualkan esok 9 pagi 23 Mei 2012, ditangguhkan ke 6 Jun 2012. 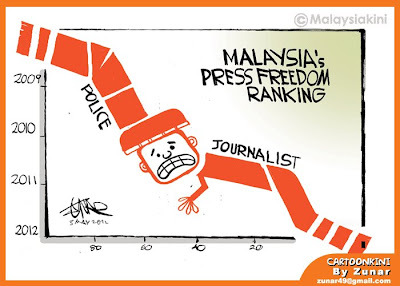 The Malaysian cartoonist Zunar issued a press notice yesterday to remind that a decision will be rendered in two days on his civil suit against police political authorities in his country regarding his unlawful detention a couple of years ago due to the content of his bookCartoon-O-Phobia. The cartoonist was held for two days, was investigated under the Sedition Act, and if my memory serves was picked up right before some crucial publicity-style events designed to drive sales of that volume. One of the key concerns in the suit is that Zunar was arrested before the books were publicly available, which combined with the fact that no one has come close to rioting or anything like that due to Zunar's cartoons, puts some stress on officials' claims that there was some sort of imminent danger that called for the cartoonist's detention. Due to Malaysian law, the court could also decide that Zunar has to pay the government about 8000 Euros for bringing the case in the first place. This also to my mind doesn't really get at a key of the Zunar matter, which is the chilling effect the government's actions have had on the artist's ability to print and distribute his comics in his home country just generally, due to potential partners and commercial allies being frightened away. Even so, there are preferred outcomes here, obviously. So all eyes on Kuala Lumpur. 1 Moolaysia book launch in Penang on 19 May 2012. Zunar will launched his book "1 MOOLAYSIA" in Penang on 19 May 2012 ( Saturday ), 5pm to 8pm at Esplanade. If you are free may pay a visit there to meet him in person and to get his new book + signature. EVERYONE IS WELCOME ! ZUNAR akan melancarkan buku "I MOOLAYSIA" peringkat negeri Pulau Pinang di Padang Kota pada 19 Mei (Sabtu) jam 5 - 7 petang dan jualan berlangsung di tempat yang sama pada jam 8 malam. SEMUA DIJEMPUT HADIR. Sekumpulan seniman bebas menyampaikan penghargaan kepada pengerusi bersama BERSIH, Datuk A Samad Said atas pengorbanan yang ditunjukkan Sasterawan Negara itu dalam membela hak rakyat. Pemimpin utama Kumpulan Kartunis Independen, Zunar (foto)berkata anugerah Seniman Rakyat itu diberikan atas pengorbanan tenaga, minda, bakat dan titik peluh oleh A Samad. "Hari ini kami, Kumpulan Kartunis Independen mengiktiraf seorang seniman, budayawan yang mengabdikan karya-karyanya demi membela rakyat, demi membuka mata rakyat dan sentiasa berjuang di garis depan membimbing rakyat. "Beliau tidak mengharapkan darjat dan kebesaran malah sanggup menempuh rintangan biar berdepan dengan kekuasaan dan hujung senapang demi sebuah prinsip dan kehormatan sebagai manusia," katanya. Zunar atau nama sebenarnya Zulkiflee SM Anwar ulHaque berkata tidak memadai sekiranya seorang seniman hanya berjaya menghasilkan karya seni demi keuntungan peribadi tetapi mengabaikan penderitaan rakyat di sekeliling. Seniman seharusnya mengabdikan karya "untuk kepentingan rakyat terbanyak, membela rakyat tertindas dan perakam denyut nadi rakyat," katanya dalam ucapan di satu majlis KKI di Kuala Lumpur semalam. Perhimpunan BERSIH 3.0 untuk menuntut pilihan raya bersih dan adil yang dipimpin A Samad menarik kehadiran sehingga 100,000 orang pada 28 April lalu. Dalam ucapannya selepas itu, A Samad turut memberikan semangat kepada kartunis dan seniman supaya terus memperjuangkan kebebasan dan menjaga hubungan dengan tuhan. "Kalau ada halangan, rempuhlah kerana itulah maruah seorang seniman," katanya yang turut menceritakan pengalaman beliau mengadakan protes 'duduk bantah' di Kuala Lumpur. Majlis ringkas itu turut diserikan dengan persembahan lagu Mentari Kuning, Menyalalah yang turut disertai Pak Samad dengan isterinya.